An athlete knows that what speed kills really mean. He knows exactly the importance of speed on every sport. Speed is not only important for a runner, but also for so many types of sport like basketball and soccer. If you are really fast, nobody can come after you and you will get more chance to score. However, many of these athletes and some of the coaches do not know how to really improve foot speed, not only their agility, but speed. Speed is not the same with agility. You can be agile but not fast. When you are standing on hot coal, your feet will be agile enough to make as many movements possible to avoid the heat, but it is different when you are on solid ground. If you are agile on solid ground, you may not have enough power to be fast. But if you want both, the speed and agility, and coordination, you may need to try the ladder exercise. This set of ladder exercise is meant to give quality and form, but not to leave the athlete overload and breathless. This exercise usually performed at the start of a training session, directly after the warm up because at this time, the muscle is still fresh. With fresh muscle, it is easier to produce good quality of movement. Since the ladder exercise is not meant to exhaust an athlete, therefore after this drill. He can still follow the sets of drills afterwards. 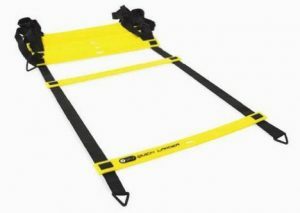 There is a new invention, a ladder like tool, to help everyone to get the fast and agile feet, that is the Quick Flat Rung Agility Ladder. This tool is made by the Pro Performance Sports which is based in San Diego. This company is known to produce high quality sport tools with a very competitive price. This ladder has 11 rung with the width of 15 inch each step. Its sidebar is made of high durability nylon straps that can be stand even the most frequent ladder exercise. This tool can be used for many objectives, beside the fast and agile feet; they can also be used to lose weight. And able to get the best result, we can check their instructional DVD for a 6 week training workout that is already included in every purchase of this item. Furthermore, this easy to move sport tool is also equipped with a stylish carry bag to ease movement.